The most random and amazing things happened at my company Browserling in the last few weeks. 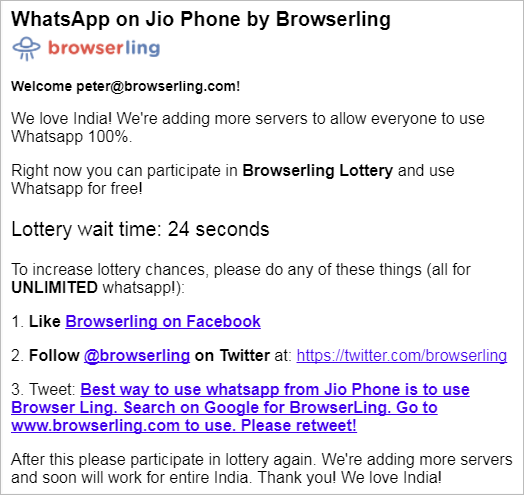 Someone in India discovered that they can use WhatsApp on very cheap $20 phones (Jio Phones) via Browserling. These cheap phones can't run WhatsApp but if you go to Browserling, you can use it via web.whatsapp.com. He made a video (first video below), the video went viral, got reposted everywhere, and more people started making videos about it (some more links below). 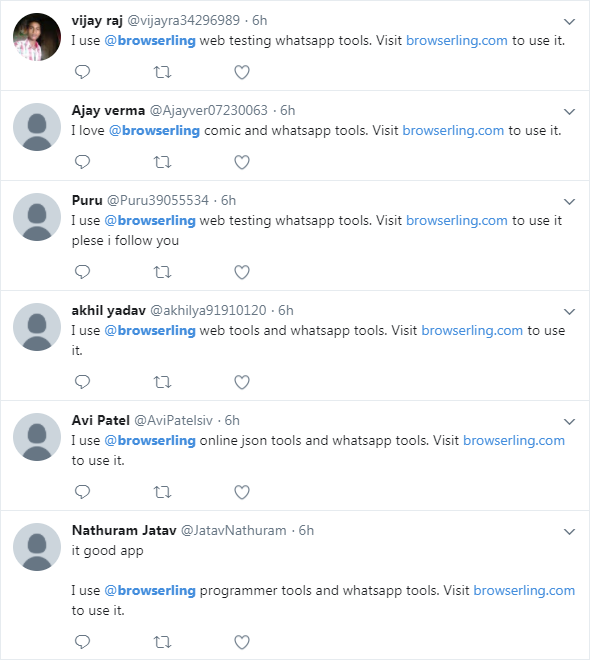 I started getting crazy traffic, thousands, then tens of thousands of visitors and it just kept increasing from India, all trying to use Browserling as a WhatsApp proxy tool. Indian blogs picked it up, started reposting it, too. Traffic was going insane. I couldn't handle tens of thousands of free sessions and it just kept increasing. I couldn't understand what was happening. 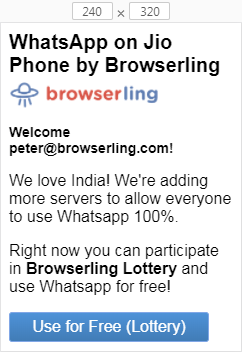 Why was everyone trying to go to WhatsApp inside Browserling? I didn't know there was a viral video. I thought it was a DDOS attack. 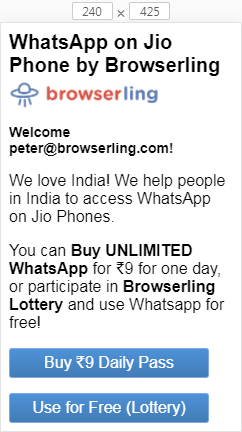 I noticed everyone had this weird user agent that said it was a JIO phone. I throught these attackers were fools. A classic newbie mistake not to randomize the user agent. So I quickly banned this JIO user agent with "fatal error" message. 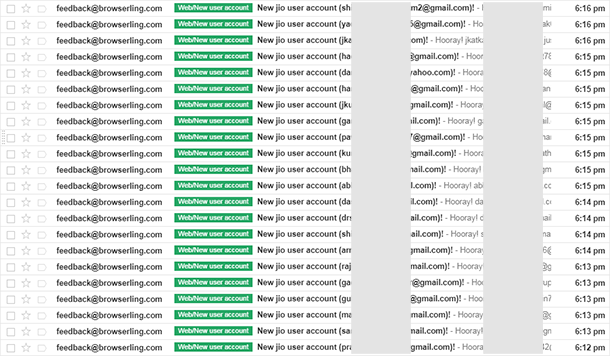 But instead of a victory, my web servers started getting DDOSed even more, these users were hitting refresh like crazy. I spent half a day identifying the attackers, found that it was all Indian IPs and blocked half of country at firewall level. All was well. I could go to sleep. But then suddenly someone messaged me and said why don't I let him use WhatsApp. 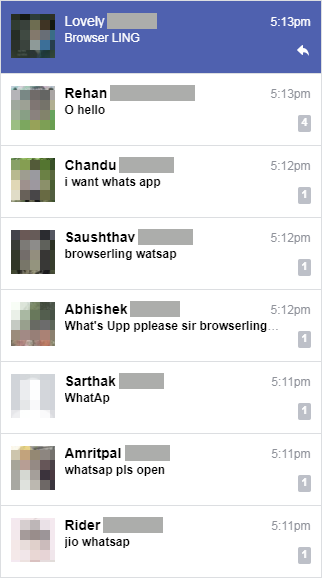 Then 100 users started messaging me. Then 1000s. My Facebook was blowing up. I was now thinking I was under the most sophisticated attack ever on a personal level. I had no clue what was going on. I started blocking all these people but I was getting messages faster than I could block them one by one. I was freaking out. I decided to delete my Facebook for my own safety. While I was looking for the delete link, I accidentally noticed a link to YouTube in one of the messages. I opened it and I instantly got it. This was no attack! I was going viral! But I still didn't know what to do and kept "fatal error" message. They started linking to my competitors as an alternative solution. I was thinking, hah, great, let them crash competitor websites. A few more days went by and and then it suddenly struck me! 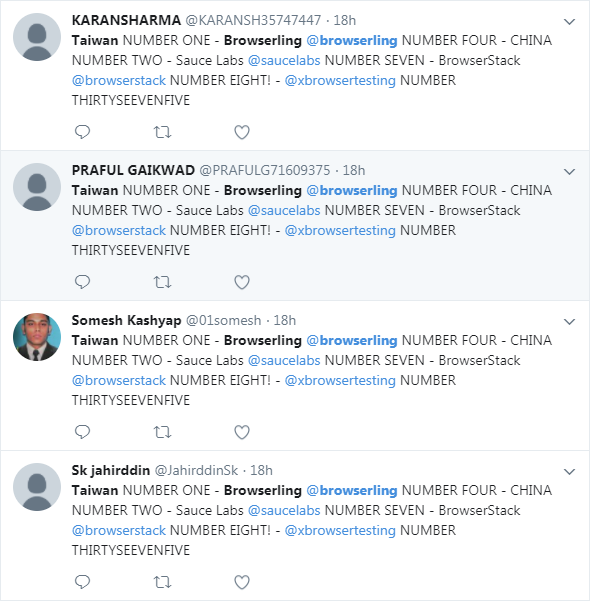 Why am I blocking these users?! This is the biggest opportunity ever! I can capture tens of millions of users. Everyone in India who uses this phone. I had no idea how much these phones cost or how much money Indian users spent on online services. I quickly put a $1/day link for 1 day of Browserling to see if I could easily monetize it, but no one bought this subscription. Then I decreased the price to $0.50 and still no one was buying. I put a $0.10 cents sessions and still no buyers. I couldn't provide a free service to all of India, so I decided at least to do something with this traffic. That was super hilarious. I was literally rolling on the floor laughing. TAIWAN NUMBER ONE! COMPETITORS NUMBER NINE! 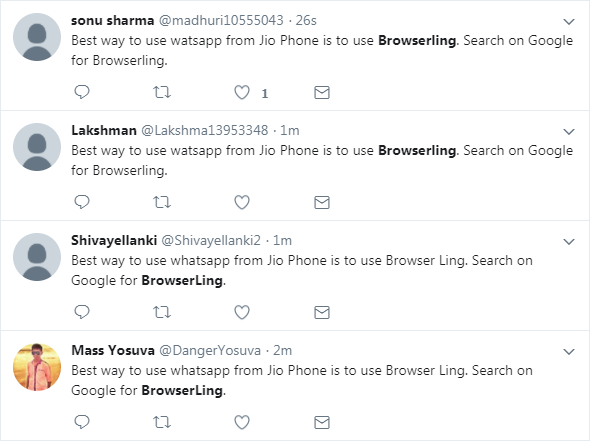 Turns out Jio Phone users would tweet, follow, like, and do anything I tell them to get access to Browserling. Very interesting. After having had fun with this I remembered I had many loyal blog readers from India. I messaged some of my blog followers from India and we talked about this. It turns out users in India can't easily make online USD purchases with credit or debit cards as it requires a special bank permission. That's why no one was signing up for a subscription for a $1 or 50c or 10c. 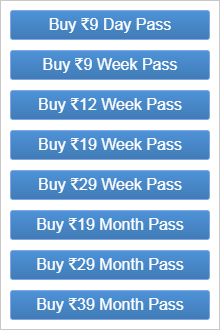 I kept chatting with my friends and it turns out in India they have their own localized payment system that they use. It's hard to access from the outside. So I teamed up with my friends Sunit and Wrishiraj from Assam, India. They've built a Linux distribution for India called SuperX and have a company called Libresoft also based in Assam that can easily accept Indian payments such as UPI, prepaid wallets, and local debit and credit cards that work only inside India. 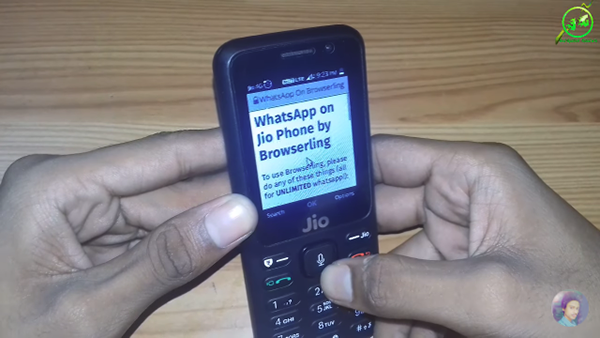 I got to work and over last two weeks I built a "WhatsApp over Browserling for India in an old browser on a $20 Jio Phone". The price is in rupees. 9 rupees is 14 cents, 19 rupees is 30 cents, 29 rupees is 45 cents, 39 rupees is 60 cents. I'm using the local Indian payment processor called Instamojo, which is Stripe for India and integrates together all possible Indian payment methods. This is well aligned with Browserling's vision, which is "run any application on any platform in any browser." 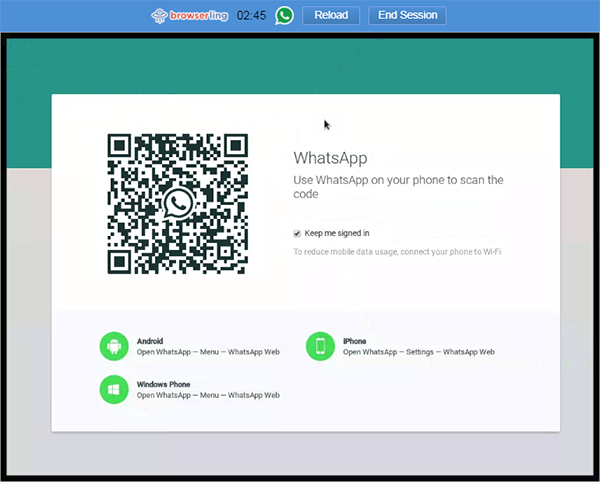 In this case I've a web version of Whatsapp running in a Chrome on Linux, used in a cheap $20 phone's browser. I will keep you posted about what happens. Do I take over India?! Does this go further and it's a success in Africa, too?! Or does this go nowhere? Find out in the next episode of incredible events at Browserling! See you next time!